If your laptop computer has an ExpressCard/54 slot, using ExpressCard/34 adapter cards doesn’t have to be problematic— ExpressCard/54 and ExpressCard/34 cards share the same connector and plug in the same way. But if you use a smaller card with cables connected to it, you may be in for a nasty surprise. 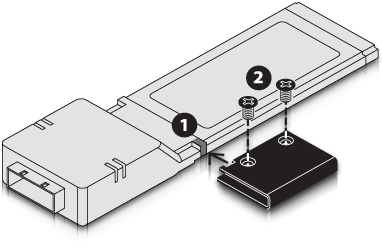 The ExpressCard/54 slot was designed to accommodate smaller cards, using a guide that guides an ExpressCard/34 adapter into place to mate the connectors properly as you insert the card into the slot. Unfortunately, this guide won't keep an ExpressCard/34 card from shifting in the slot and potentially disconnecting the card and anything connected to it. Sonnet's ExpressCard/34 to 54 Stabilizer helps prevents the problem. This steel bracket clamps to the side of an ExpressCard/34 adapter to make it just wide enough to fit snugly in an ExpressCard/54 slot and prevent free side-to-side movement, providing needed stability. The ExpressCard/34 to 54 Stabilizer is easily attached and removed, and is compatible with most ExpressCard/34 adapter cards.